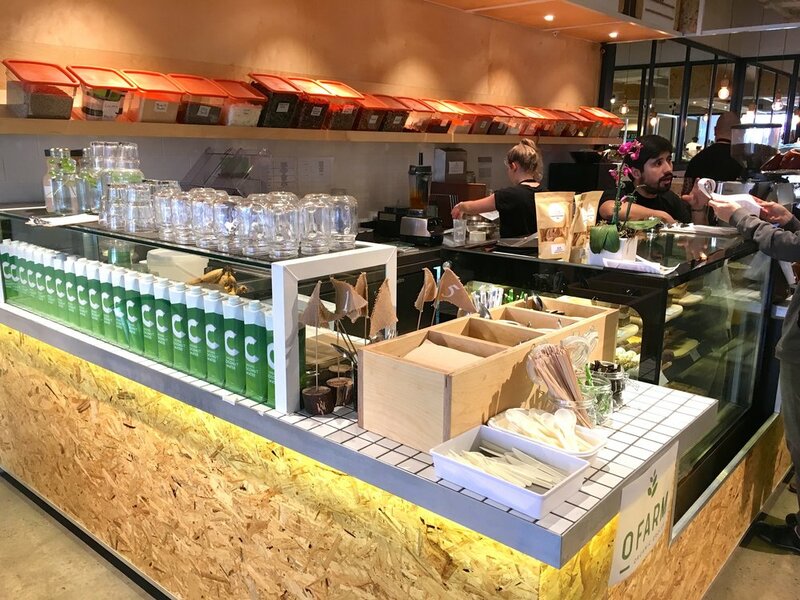 Vegan, raw, organic food might not sound attractive everyone, but this café serves up some really tasty goodies! It is tucked away on the carpark level of the shopping centre, but we are glad we found it and had the pleasure of sampling the menu here. 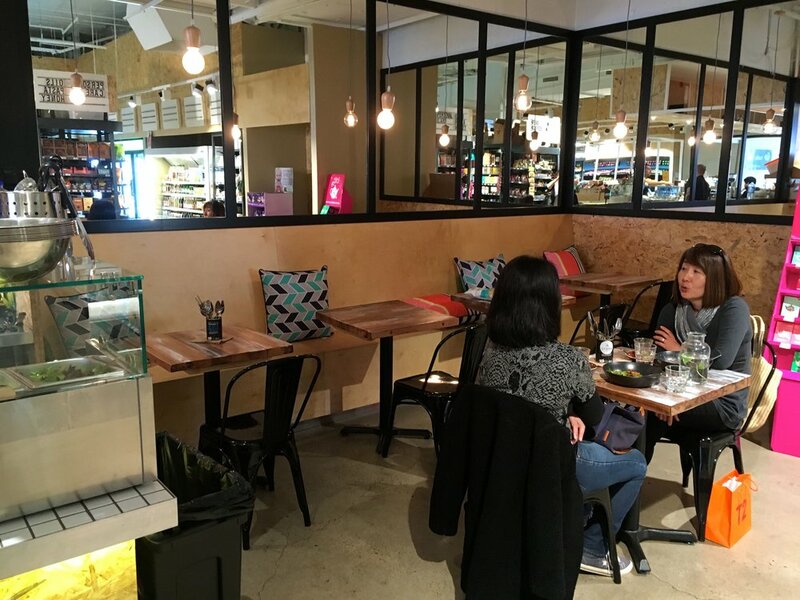 There is a comprehensive organic grocery store on one side and a bright, clean eatery on the other, with a tempting sweet treats display and small seating area. 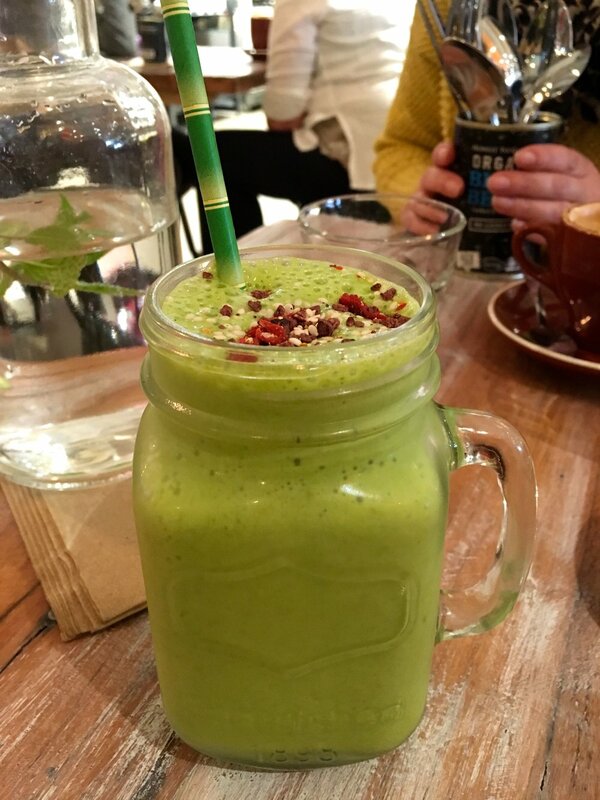 We started with a hot and cold beverage – a Flat White with almond milk and a Green Classic smoothie. The smoothie was made from home-made almond milk, activated turmeric, banana and spinach. It tasted great and Dame V said the coffee hit the spot. Head Chef, Juan Carlos, ran through the menu with us and suggested some options. We chose to start with the Banana Bread and Bacon from the breakfast menu. It sounded intriguing – sprouted banana bread with eggplant bacon, fresh banana and maple syrup. Sweet and delicious! It was a great combination and the sweetness contrasted nicely with the salty marinated eggplant strips. Next up was the California Roll, which were conical wraps of nori, spiced cauliflower rice, assorted vegetables, marinated tomato, avocado and wasabi and spirulina mayo. The Asian dipping sauce on the side was to die for, so we poured it on top. This dish is an absolute winner and one we will be going back for! 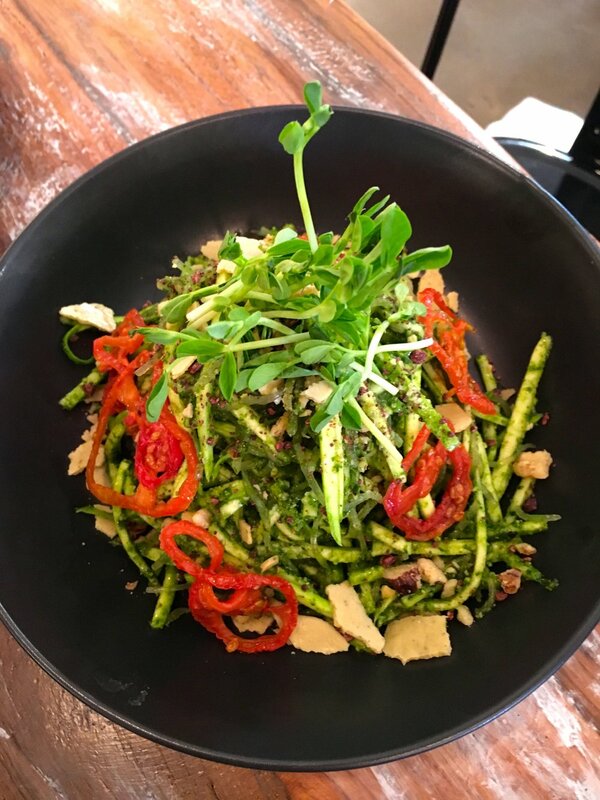 We followed the rolls with Kale Pesto Noodles which was an impressive pile of zucchini and kelp noodles, marinated tomatoes, walnuts, cacao nibs, parmesan cashew cheese and snow pea sprouts all tossed in a kale pesto dressing. Everything was so fresh and well-chosen and the marinated tomatoes were super tasty. The combination was outstanding and we were both impressed with this dish. 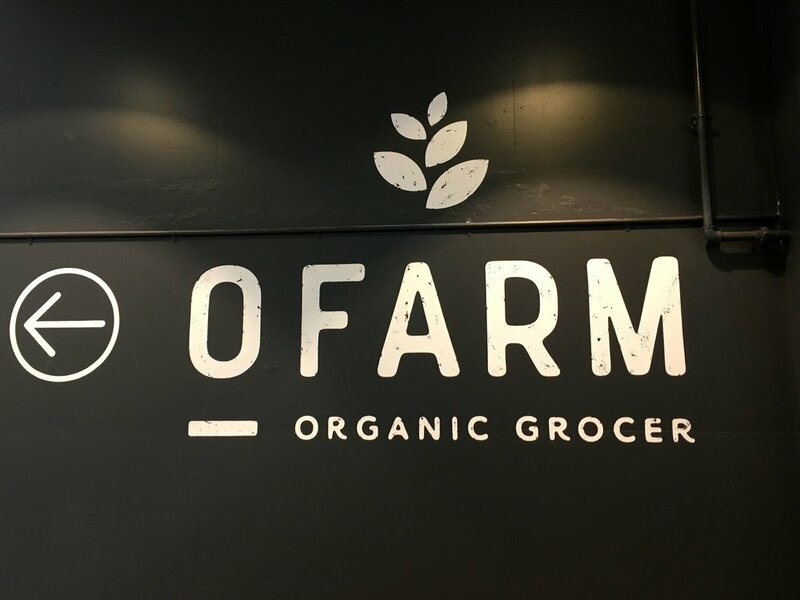 OFarm is open 7 days a week from 8am until 3.30pm and it’s a place everyone should try. Their style of food leaves a diner feeling full but not heavy and I promise you will be craving vegetables for a long time after a visit here! Chef Juan Carlos is putting on a “nut milk making” event on October 19th and you should check the website for others as they come up. What a shame we couldn’t squeeze in one of those awesome-looking sweet treats from the display counter. But there will certainly be a “next time” for us. Those Dames, who review exclusively for Sir and Mlady Dine Out, dined as guests of Ofarm Organic Cafe. Thanks to Sahil Mehta for the invitation, and to Juan Carlos for sharing his passion and taking us on a very interesting vegan journey.